If West Michigan native and rising Nashville prodigy Billy Strings is thankful for only one thing this Thanksgiving, it’s that he’ll finally get to spend at least one night back home. There are many strange stories about how bands catch a break, but it doesn’t get stranger than the story of Post Animal. Halloween has become more than just a time for tricks and treats. It’s the end of a season, when autumn leaves give way to the ominous chill of brisk winter air lurking around the corner — we’ve found it’s the perfect time to get freaked, freak out others and otherwise embrace your inner freak. In the spirit of the season, we’ve compiled a quick list of some of the most scream-worthy scares and other fiendishly fun events held in honor of All Hallow’s Eve. What started as a cheeky Instagram photo has turned into a large casting call for all badass babes. If you’re not on board, kindly move out of the way. ArtPrize is celebrating its 10th birthday by collecting stories from its past and planning changes for its future. 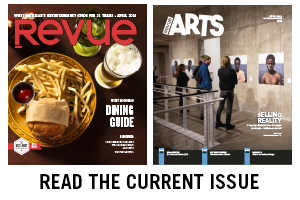 Kevin Buist, ArtPrize’s artistic director, talked with Revue about what we can expect for this year’s festival as well as what’s new for ArtPrize, such as the fest’s bi-annual switch and the new Project 1. This month, the African American Art and Music Festival is teaming up with ArtPrize to bring art, performances and great food to downtown Grand Rapids.